​Those of us who have pets know how challenging it can be to be there every time they need our attention. With the kind of busy lives we lead and the fact that the world is now very much a global village, we may find it increasingly difficult to accomplish everything we need to do, while also dedicating the much-deserved time our pets want and need. What do you do about your pet if you have to go on an extended trip for work? Do you bring them with you? Do you pawn them off on your neighbor to feed? What if they can't watch your pets during that time either? The fact that you might not be around to feed your pet does not negate the fact that they still need feeding. That is why automatic pet feeders have found a strong footing in the modern-day market. Just because you lead a busy life does not mean that you cannot have a pet at home. There are ways you can still manage to take excellent care of your pet while fulfilling all your other obligations as well. With the right automatic pet feeder, you can do just that and be able to take care of what you need to do while knowing that your pet will have food even when you are not at home. We must say that 'isYoung 5.5L Automatic Pet Feeder' is one of the most convenient pet feeders on the market today. Mostly because it has all the features you would expect to find in a convenient pet feeder. ​​​​The pet feeder should also be large enough to give you the freedom to go about your business without having to run back home every few hours to refill it. That is why theisYoung 5.5L Automatic Pet Feederis an absolute must-have for those people who still want to keep pets despite their busy schedules. Why Purchase an Automatic Cat Feeder? The simple answer to this question is convenience. Automatic pet feeders are extremely easy to use, and they allow you to take care of your pet while living your life simultaneously. In the scenario discussed at the beginning of this article, we saw how you how you may need to go on an extended trip out of town for work or other reasons. You can’t always bring your pet with you when that happens,and you can’t always depend on your neighbors to constantly come to your rescue.It is only logical to find a viable solution that will work for both you and the pet as well as your neighbors. ​​The best part is that these feeders can do this without necessarily messing up your entire house or jamming on you,so the pet gets no food. Once you program the isYoung 5.5L Automatic Pet Feeder, you can sit back and relax knowing very well that your pet will have enough food until you come back. 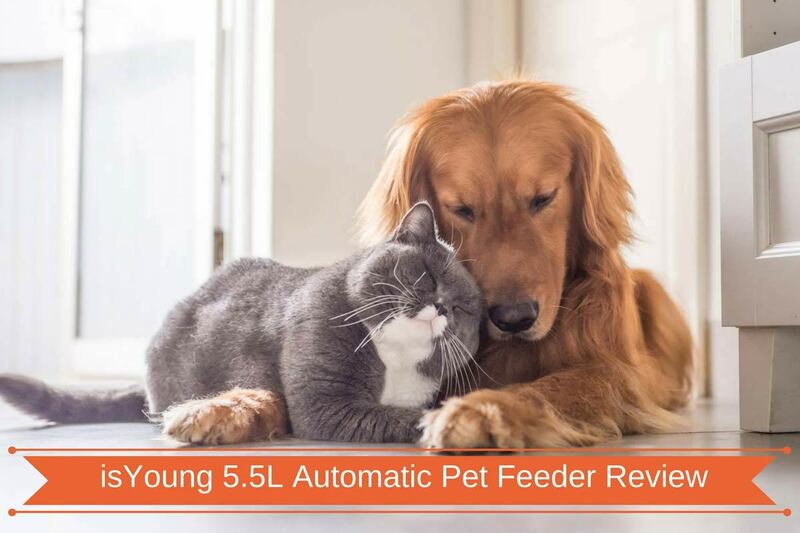 Brought to you by the isYoung Group, this automatic feeder is perfect for those pets that are content with having a 3-times a day feeding schedule. 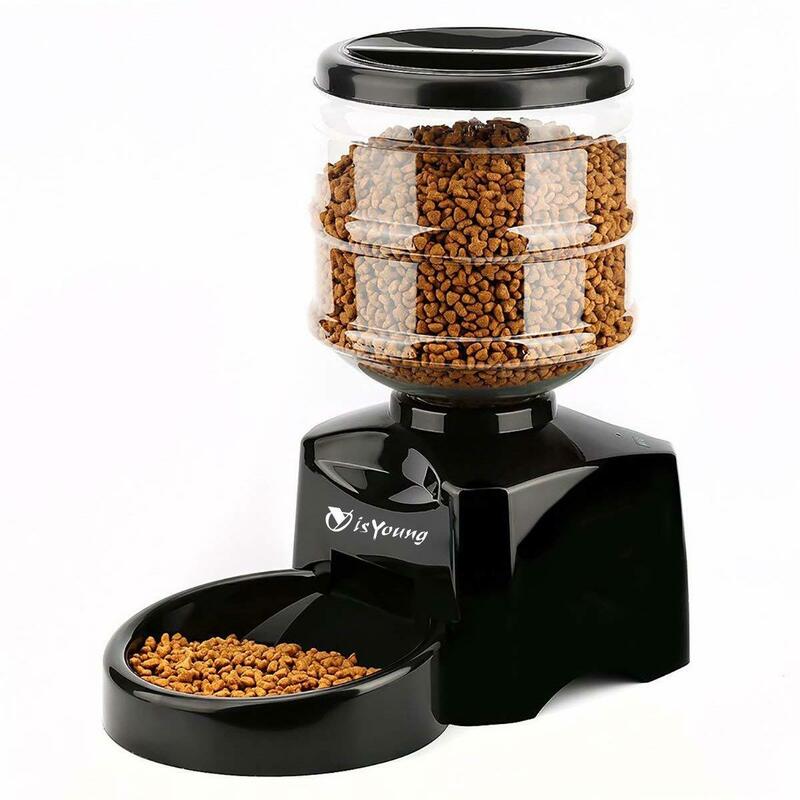 While it has a huge 5.5L capacity, the isYoung 5.5L Automatic Pet Feederis generally designed for smaller pets, such as cats. One of the most outstanding features of this automatic pet feeder is that it is easily programmable which means you do not need a degree in computer programming to use it. The user interface is quite friendly, and the entire gadget does look rather good, so it will not mess up your decor. ​​​​​​It is easy to use and program as well as clean. You can even leave pre-voice-recorded instructions for your pet on the machine itself. It has a voice recorder that can record up to 10 seconds of your voice. This allows you to remind your pet that it is time to feed even when you are not there. ​​​​While this isYoung 5.5L Automatic Pet Feeder review shows you what this automatic pet feeder can do and how it can make your life that much easier, it is important to note that it is not suitable for those who only serve their pets dry foods and are not comfortable with a 3-servings a day schedule. This automatic pet feeder could be the answer you have been looking for when it comes to a pet feeder that will keep your pet well fed throughout the day even when you are not home.